The University of Florida softball team hosted Santa Fe College for the second time this fall on Thursday night and came away with an 8-4 win. Junior Tiffany DeFelice made an impact with two lead-off home runs and went 3-for-5 with two RBIs. Freshman Ensley Gammel pitched six innings and struck out seven while allowing only five hits. The Saints jumped out to an early start with a 3-0 lead after Venica Brown hit a three-run homer to right. In the bottom of the inning, junior Aja Paculba led off with a walk. Classmate Megan Bush smoked a 2-1 single to left field as Paculba hustled around third to score, putting the Gators on the board and cutting the lead to two. Freshman Brittany Schutte gave UF another boost with a solo shot over the wall in right center in the bottom of the second. 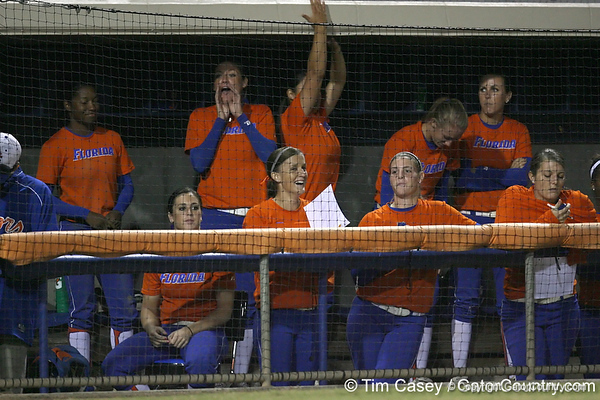 The Gators got their spark back in the third inning. Gammel out of a jam by getting Gia Tomossone swinging while there were two runners in scoring position. In the bottom of the inning, DeFelice tied the game with her first bomb off the scoreboard in center. In the sixth, DeFelice got the crowd on its feet by tallying her second lead-off bomb of the night, also off the scoreboard. Freshman Erin Schuppert then came in to pitch a 1-2-3 inning, catching two Saints swinging, to close out the seventh inning. In the home half of the seventh, Gammel hit a ball deep into center field for a double. Moultrie moved her to the corner on a sacrifice bunt. Paculba then laid down another bunt to score Gammel as she hustled in from third for the Gators’ final run of the game. Florida plays its final fall game on Friday, Nov. 13 at 6 p.m. against Chipola College at Katie Seashole Pressly Stadium.